From left, HVEDC Board Chairman Robert J. Levine, Esq., HVEDC CEO Mike Oates, WCA President and CEO William M. Mooney, Jr., WCA Vice President Amy J. Allen, and WCA Managing Director, Operations & Events Julia Emrick. 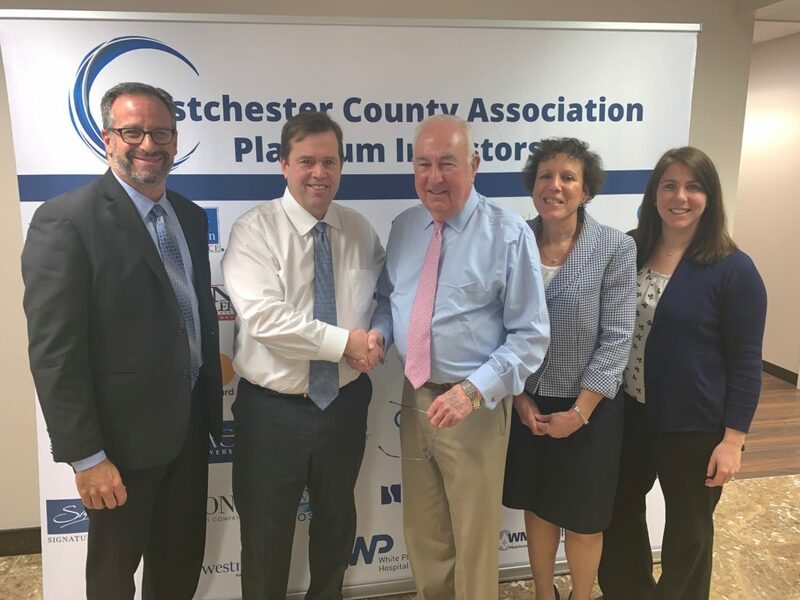 WHITE PLAINS—The storied Westchester County Association, which has been one of the county’s leading business advocacy organizations for nearly 70 years, says it intends to merge operations with regional economic development agency the Hudson Valley Economic Development Corp. The deal between the two organizations is intended to create a regional economic development and business advocacy organization. William M. Mooney, Jr., the current president and CEO of the WCA and Mike Oates, HVEDC CEO, told Real Estate In-Depth that the merger should be finalized in the near future. The WCA and HVEDC announced that their respective organizations have agreed to pursue the merger of the two organizations. Mooney, who announced in October his intent to retire, will serve as CEO of the yet-to-be-named organization until his retirement on Sept. 1, 2019. Oates will initially serve as president and then will assume the title of CEO upon Mooney’s retirement. Oates in a conference call said that Mooney will likely serve the regional organization on a consultancy basis after his retirement. The yet-to-be-named organization will be housed at the WCA’s current headquarters at 1133 Westchester Ave. in White Plains and will have regional offices in other Hudson Valley locations. All current staff of the two organizations will be retained. The WCA was founded in 1950, while the HVEDC was formed in 2003 as a regional economic development agency that serves Westchester, Rockland, Putnam, Orange, Ulster, Dutchess and Sullivan counties. At its formation, a primary sponsor of HVEDC was utility Central Hudson Gas & Electric Corp.
Robert J. Levine, Esq., the current chairman of HVEDC, will assume the role of First Vice Chair of the new organization’s board of directors. WCA and HCVED officials state that some of the benefits of the merger will include the organization having enhanced legislative power, as well as serving as an independent voice of businesses and the communities it serves with proactive policies and initiatives that foster smart growth and economic vitality in the region. Other functions of the new organization include advocacy for the business community, including on key industry sectors in the Hudson Valley on a local, state and federal level; launching innovative programs for the entire Hudson Valley and offering new channels of distribution for organizations throughout the region. The new organization appears to be advancing many of the previous initiatives undertaken by the WCA and HVEDC. For example, the organization states that its focus will include healthcare advocacy and promoting the region as “BioHud Valley,” initiatives that were undertaken by the WCA and the HVEDC respectively. The organization will also focus on real estate, housing and intends to work closely with the real estate community to advocate for smart growth policies in the Hudson Valley. The organization will also provide up-to-date information about available buildings and sites, identify available incentives and assist in the project approval process. Other core areas of focus will also involve workforce development, cluster development that will foster programming designed to support and grow key industries in the Hudson Valley including biotechnology and healthcare, food and beverage, tourism and hospitality and advanced manufacturing, and call for the advancement of the “Gigabit economy” in the region. Mooney says that the merger deal in fact was done outside of that rebranding initiative. In a conference call announcing the deal, Mooney downplayed the competition that has existed between the WCA and the Business Council of Westchester. Both Mooney and Oates said that their respective organizations have worked with a host of business and economic development groups in the Hudson Valley region, including the Business Council of Westchester.